Earlier this year we analysed the most recent financial statements provided to Companies House by 28 of the most important British P2P firms. We wanted to know how much equity had been invested into each platform. How much did they have left? Were they profitable? Before investing in a platform we want to know that it will still be around in a few years. Looking at the amount of equity, and profitability are good short cut ways to assess this. We will provide the profit data in a future post. The numbers we discuss below are ‘shareholders equity’ (the assets less liabilities of the firms). Please note – some of the platforms may have published updated financial information since we pulled the figures during March-May this year. 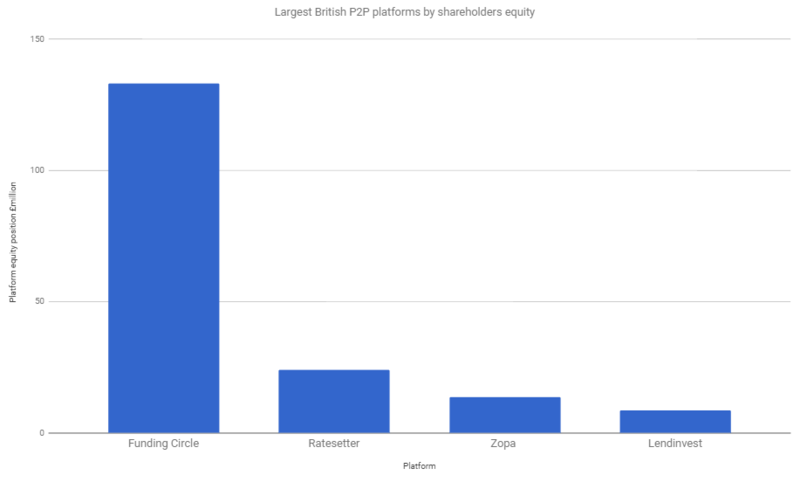 Funding Circle, Ratesetter, Zopa, and Lendinvest combined represent 93% of the total shareholders equity disclosed in the most recent financial statements of British P2P firms. Lendinvest is currently profitable, the other 3 firms are currently loss making. 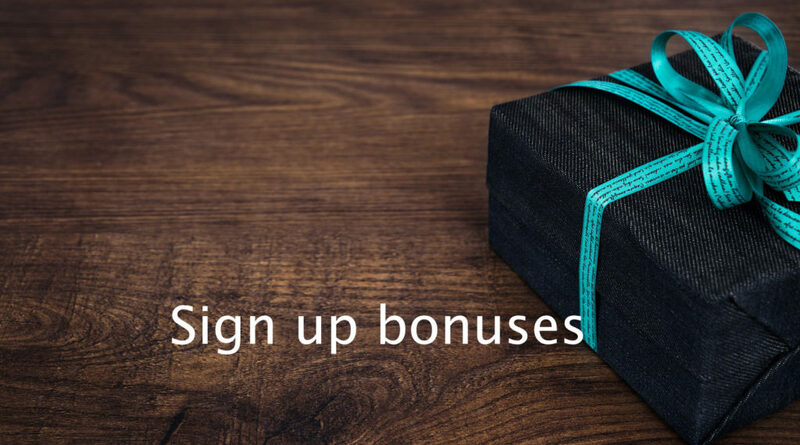 Funding Circle has been raising equity at strong valuations from investors, it is also generating the largest losses of any British P2P firm. 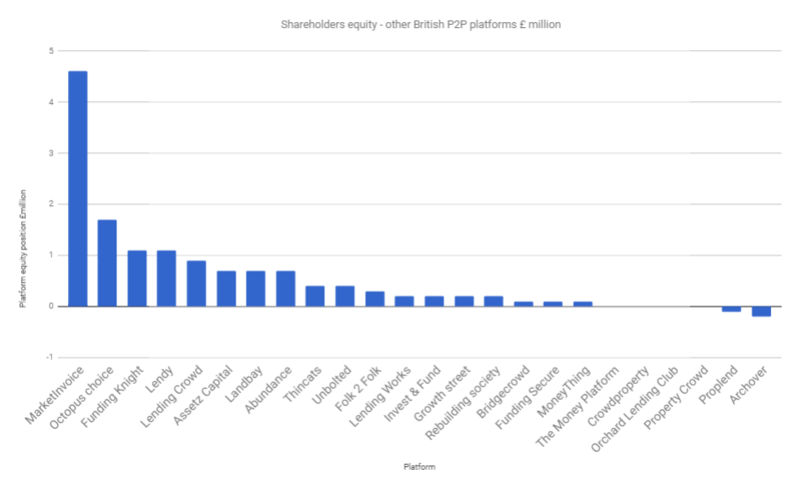 The chart below shows the amount of shareholders equity of 24 British P2P platforms. It is clear that the amount of equity held by most platforms is modest and in a few cases negative. In some cases the platforms were new and had received very little initial investment, and in others the platforms had been making losses which were being covered through additional equity injections. Who owns the business? Is it part of a larger financial group? If so this is positive as it provides a source of future equity. It also creates important reputation issues for the group if they let the P2P platform fail. Is the business profitable? If not how close to profitability is the business? What is the trend? Generally, we feel that most British platforms should be more strongly capitalised. We would not be surprised to see some mergers take place in the coming years. As volumes continue to increase, we expect many platforms to reach profitability and build their equity levels. We expect most of the platforms to have additional rounds of equity raising until they reach a solid trajectory. It’s clear however, that for now, all investors should pay close attention to the performance of each platform, and make sure that they diversify their investments across many platforms. Some of the platforms we list above may not find a profitable business model, and may need to wind down, or merge with another platform. In the meantime, we will continue to keep a close eye on the public disclosures made by the platforms.